The Dow was up nearly 200 points, and was about 2 percent away from its all time high reached on Oct. 3. Dozens of S&P companies, including Bank of America, Goldman Sachs, Johnson and Johnson, United Healthcare and IBM report earnings over the next few days, while J.P. Morgan Chase, Wells Fargo and PNC reported Friday morning. J.P. Morgan’s results were seen as a good omen for the start of the earnings season, with record results that beat on the top and bottom line. Scott Redler, partner with T3Live.com said traders have been looking at the earnings season as the catalyst that could make or break the market’s effort to reclaim its highs. He said stocks started off strong Friday because of China credit data and a surprise boost in Chinese exports. That was followed by J.P. Morgan’s strong earnings and CEO Jamie Dimon’s comments that the U.S. economy was strong. The third driver was Chevron’s $33 billion acquisition of Anadarko, which sparked a rally in the energy sector as traders speculated on more deals. 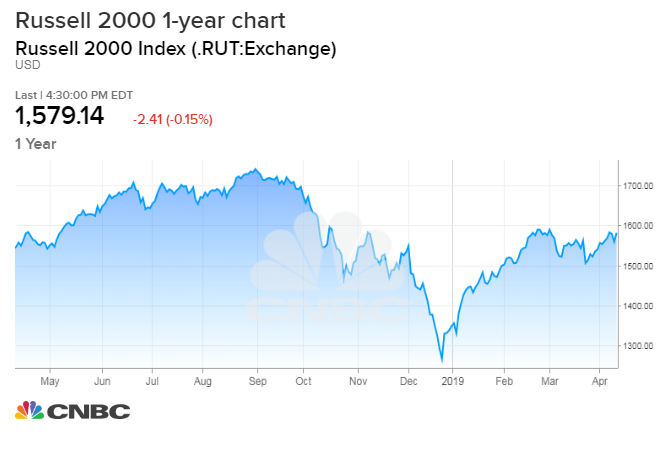 “You put all three together and now all of a sudden, we’re here at 2019 highs with 2,940 the next key spot,” Redler said. First quarter earnings are expected to see the first actual profit decline since 2016. According to FactSet, analysts expect a 4.2 percent drop in S&P 500 earnings. However, analysts are divided on whether the second quarter will be positive or negative, so the company guidance after current quarter results will be crucial to the market’s valuation. “It’s going to be the first quarter earnings that are going to take us another leg higher. If they’re not great or a lot of companies guide lower, there will not be much more upside,” said Redler. While just one report, J.P. Morgan is a bellwether for the market and financials, a key group that could help push the market to its highs. Financial shares were higher with J.P. Morgan, up more than 4% in morning trading. 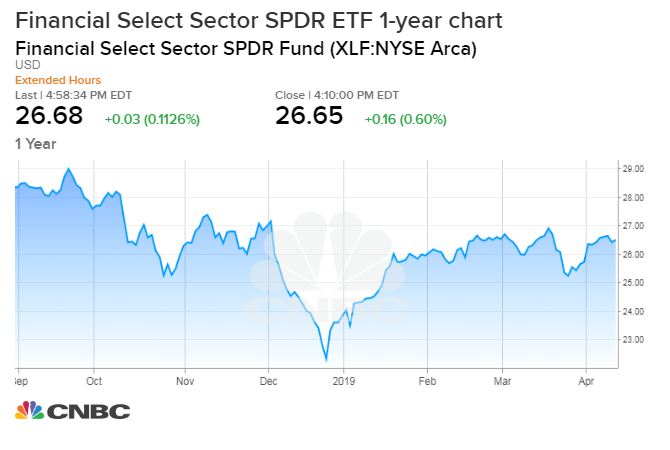 The Financial Sector SPDR ETF XLF was up about 1.5%. Since the market hit bottom after December’s wipeout, all the major sectors have rallied double digits, with the tech sector’s 32 percent gain leading the way. Financials have lagged, and are eighth out of the 11 sectors with just a 19% rebound. Health care and utlities are at the bottom each with a gain of just above 12%. According to Bank of America Merrill Lynch, financials are attracting increased investor interest. They said funds in the sector had an inflow of a half billion last week, the biggest inflow since September, when the market was hitting its highs. The BofA analysts said that hints investors could be discounting the end of the recent collapse in bond yields. Stocks could also get a push from a trade agreement with China, or even a big improvement in global economic data, but the earnings season is important, barring a major trade development. “You just need an extra push here. The important thing is what does that internal participation look like when you get that new high. Is it just the tech and FANG stocks, or is it industrial and financials, and even energy contributing to the move?” said Todd Sohn, technical analyst with Strategas. The S&P technology sector this week hit a new all-time. But earnings expectations for the sector may not be all that great. For instance, semiconductors have been surging but analysts expect about a 20 percent decline in their earnings, and their outlooks could be grim, with another big profit decline expected next quarter. Nonetheless, investors continue to make bets that the economy will come out of the doldrums and earnings will carry the market higher. Sohn said many indicators point to further gains, but there is a warning in the large amount of call purchases investors are making in the options market. When call buying, or options that bet on higher stock prices, outpace put buying, used by investors looking for declines, it can be seen as a contrarian indicator for the market. The thinking is that investors could be too comfortable with rising prices and are complacent. Analysts have also been looking for a pick up in small cap names which have lagged the large caps.